As predicted in our ‘Trends to look for in 2017’ blog, workplace wellbeing is high on the agenda for employers everywhere, as highlighted in a report published last month. This is great news for employees all over the world and underlines the growing importance of a healthy, happy workforce. Reward & Employee Benefits Association (REBA) in association with Punter Southall Health & Protection were the architects of this 56 page report which exposes the continual drive for change we are seeing in corporate attitudes in improving employee wellness at a rate never seen before. Of those who took part in the study, 45% said they had a ‘clearly-defined wellbeing strategy in place’ in their workplace, up 15% from the previous year. Of those, 26% have had a strategy in place for more than 3 years already (11% of the total). 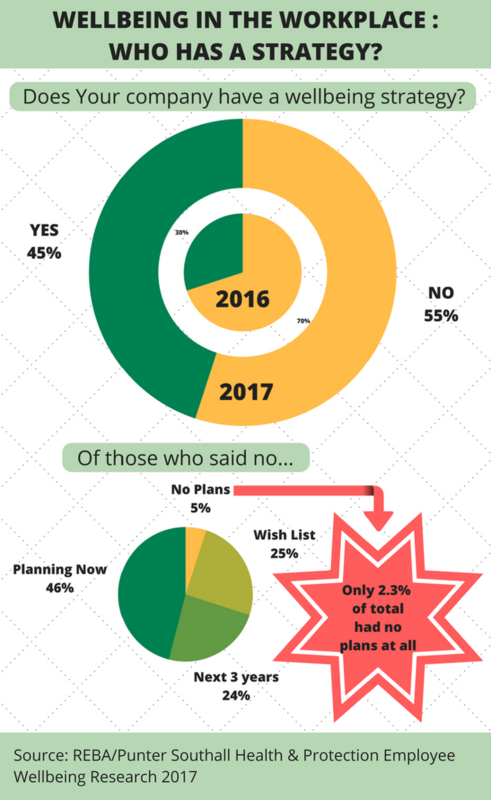 Of the 55% who did not have a strategy, 46% were planning on implementing one during 2017, and 24% were working on introducing one within the next few years. Of all the companies who took part, only 2.3% said they had no plans to introduce any form of wellness strategy, which is an encouraging prospect. Debi O’Donovan, director at the Reward & Employee Benefits Association, said: “We have witnessed a tremendous increase in interest in employee wellbeing strategies over the past few years, and a growing recognition of the business benefits it can deliver. 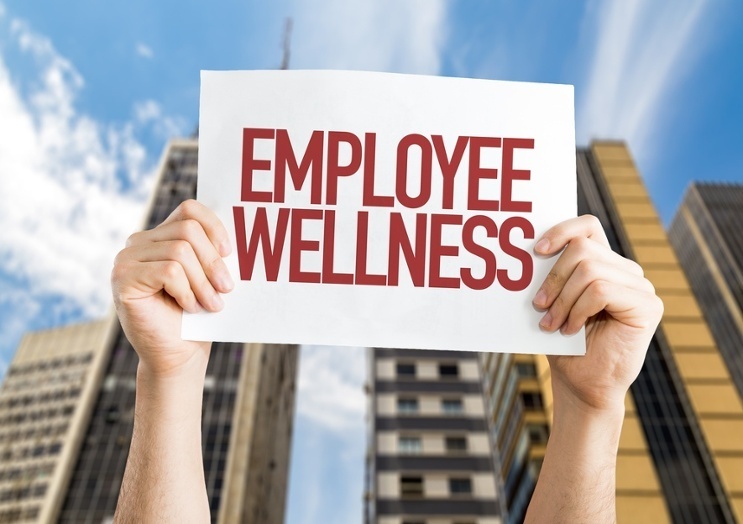 It’s clear that this will be a battleground in the coming years, with organisation’s ability to retain staff heavily linked to employee wellbeing, so what are the key components to include in your wellbeing strategy? Introducing healthy lifestyle choice initiatives to the workplace is a great place to start to increase wellbeing. Putting on nutritious food for staff, offering subsidised gym memberships, and holding workplace sports events are great starting points, and go a long way to raising morale and wellbeing among staff. Be creative, look for partnerships, and you won’t even have to break the bank. One of the biggest causes of poor health in the workplace is sedentary behaviour. 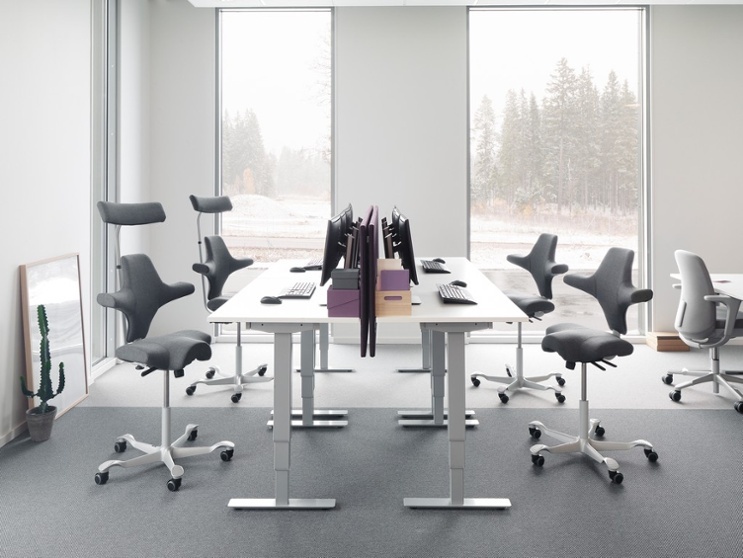 Providing office equipment such as sit stand desks, ergonomic seating and flexible monitor stands all help combat the effects of sedentary behaviour, as well as musculoskeletal problems. Of the 137 million sick days registered in the UK in 2016, 30.8 million (22.4%) were linked to issues such as upper neck and back pains, which are often caused by poor workspace configuration. Similar figures are found across the globe. Office design is a key area which in the past has been overlooked in workplace wellbeing strategies. Providing a workplace which encourages movement and fluidity to employee’s working day is really important here. Think about it; does sitting still in one place all day long, on your own, sound like a happy situation? Providing various working environments for different tasks keeps both bodies and minds agile, and will also increase interactivity among staff, which raises wellbeing even further. Check out our recent blog on workplace design to see more on how you can design wellbeing. 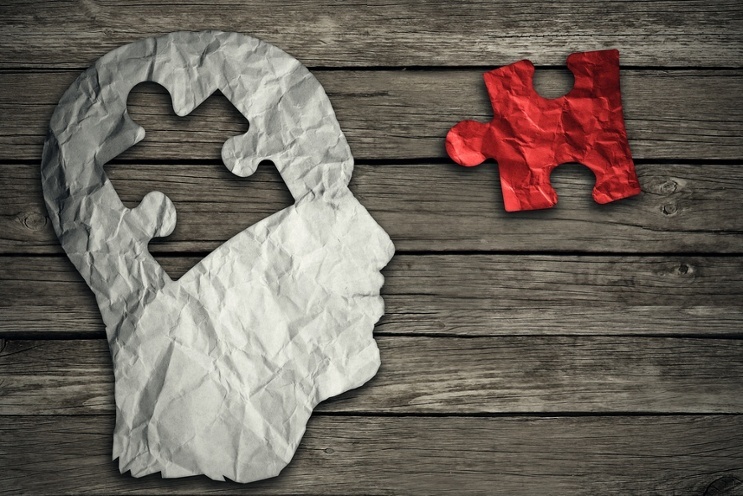 Whilst larger companies are rapidly adopting mental health strategies, smaller companies have been less able to adapt. In its recently published paper, A little more conversation, the IoD reports that small businesses do not feel they have the resources to provide adequate mental health care, and it has called on the government to provide guidance to both SMEs and larger businesses on this issue. Providing stress management training, annula leave for mental wellbeing reasons, offering counselling and leaving work a little early on a Friday are all positive ways to increase mental health. These are just a few ideas on how to implement workplace wellbeing strategies in your workplace. For more advice, do check out more posts in our blog, which cover a range of themes on this subject.